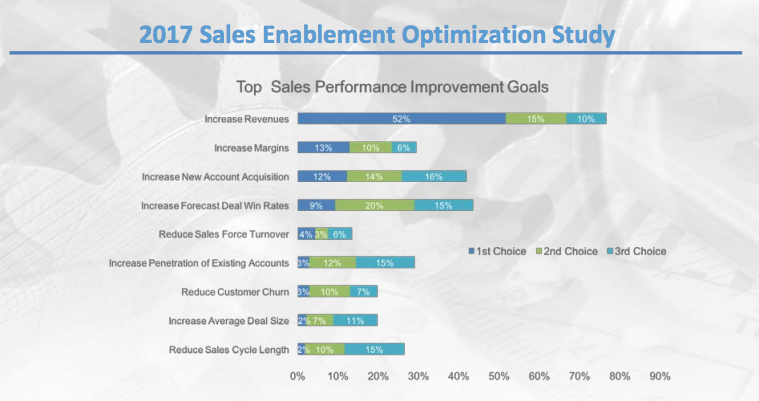 A comprehensive look at the state of sales operations and key sales enablement tools for 2018. 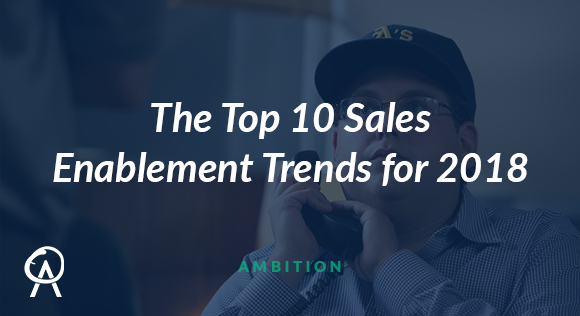 An in-depth look at the top 10 trends for sales operations and enablement in 2018. The B2B sales world is officially in uncharted territory. Looming since the turn-of-the-decade, technological disruption of the industry has achieved near-totality. It's a weird, uncertain time for sales leaders and their teams. But the playing field has never been more level. Whether you work for a Fortune 100 or a nascent startup - you are grappling with the digital transformation of sales and seeking to adjust your sales and marketing efforts to your buyer's journey. To get a lay of the land, I direct your attention to the following scene from the timeless film, Tombstone. Because frontier life is perilous for even the most seasoned, wily, and respected sales leaders. Like the Earp brothers back in the day, modern sales leaders need a trusted ally who understands the sales operations and enablement landscape. Someone who can provide the firepower and support needed to survive and thrive in the new Wild West. In other words, modern sales organizations need a Doc Holliday. And that person (or people, in larger organizations) is the leader of their sales operations, enablement, onboarding, training, and execution of strategy. Video: HelloSign Revenue Ops Will Clarke Presenting at Aligned 2017. As your sales organization begins fixating its sights on 2018, it's time to take stock of the leading industry reports on sales enablement. This post contains insights from trusted resources like CSO Insights, Forrester, Gartner, Harvard Business Review, The Bridge Group, TOPO and more to help guide your understanding of the overall sales enablement landscape as well as each individual trend. We begin with the following infographic from Forrester, which views sales enablement in the lens of a four-part pyramid. 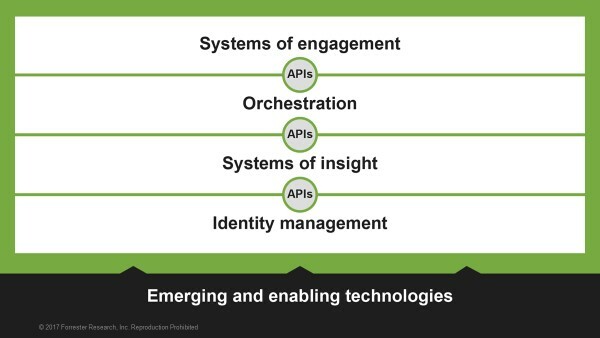 Source: How to Make Smarter MarTech Investments via Forrester. In non-technical terms, what you are looking at are the four pillars of sales engagement and operations tools. As the infographic denotes, the lynchpin to this modern sales enablement ecosystem comes from 'Enabling Technologies.' Which automate, enrich, and communicate key data insights throughout your sales organization - be it key company demographic data of a warm lead to prospect interactions with your brand on social media. The end goal of a high-performing sales operations and enablement function is orchestrated, strategic, and seamless customer experience for current and future customers that interact with your company. From their very first interaction to their last moment as a client of your product or service. In his prescient 2016 article for the Wall Street Journal, Christopher Mims laid bare the foundational sales enablement shifts resulting from the rapidly-increasng speed and democratization of data insights. Mims's depiction of this brave new world goes to the ultimate end goal of every sales enablement initiative: running an efficient revenue-generating machine fueled by real-time and crystal-clear data insights. In their 2017 Sales Enablement Optimization Report, CSO Insights offers a compelling framework for understanding the guiding focus behind sales enablement. 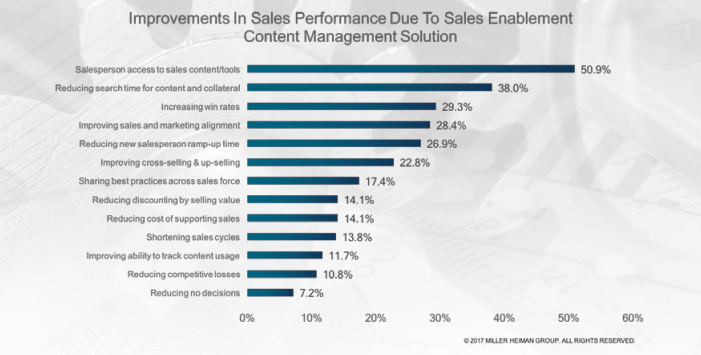 Source: 2017 Sales Enablement Optimization Report via CSO Insights. 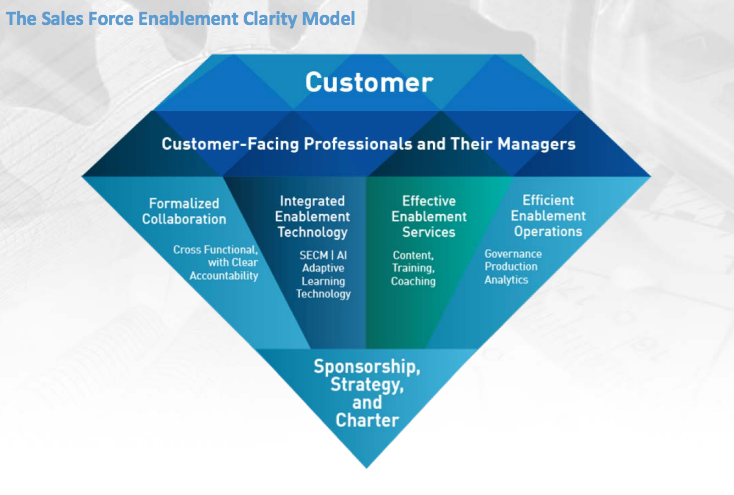 The Sales Enablement Diamond pictured above outlines the four methods by which effective sales enablement drives maximum value from the 3 P's that define your sales organization. Those methods are the universal thread linking all 10 sales enablement trends covered in this article. Both CSO Insights and the Bridge Group have published compelling reports showing the ROI benefits of strategic, well-executed sales enablement initiatives. They also provide some important cautionary tales about the dangers of poorly-conceived, poorly-executed initiatives. 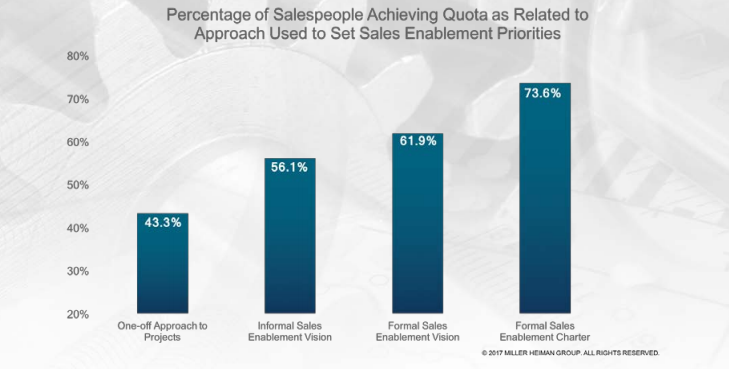 First, here's a look at the major objectives sales organizations were seeking to solve thru sales enablement in 2017, per CSO Insights's latest report. The Bridge Group's 2016 Sales Development Metrics & Compensation Report offers a look at the proliferation of sales technology inside modern inside sales and sales development organizations. As technology adoption has increased, so too has the existence of dedicated sales enablement personnel inside modern sales organizations. Source: 2017 World-Class Sales Practices Report via CSO Insights. Every successful sales initiative must begin as a formalized strategy and implemented in response to a core need felt within the sales organization. Finally, it must be mapped to the greater overall strategy and culture currently in place within your sales organization - with a clear understanding of how it should impact each aspect of your organization and work in practice with your people, processes, and technology. As we dive into each trend, take note. These are not one-off initiatives you should implement to keep up with the Joneses. They are foundational augmentations that should serve the areas where your sales organization needs the most help. And they are popular for a reason - at least one or two should resonate with every B2B sales professional with a pulse in 2018. The world is getting smaller; the market more competitive. B2B customers have the ability and willingness to shift spend. B2B companies want to business with partners they can rely on—as they should. To stay competitive, B2B sales, marketing and support leaders must leverage prospect, employee, and customer data to prospect smarter, enhance their funnel, and drive renewal and referral channels more powerfully than ever before. Source: 2016 Sales Performance Optimiziation Study via CSO Insights. In the past, buyer decision-making and internal decision-making had two trust centers: brand and gut. Today, trust has three new trust centers: data, referrals, and support. To that effect, savvy business leaders will lean heavily on data to make strategic decisions across sales, marketing and support. Data will be the North Star for increasing demand, prospecting smarter and creating shorter sales cycles and better customer experiences. #1. LeadGenius. Intelligent prospecting to find key decision-makers. As your target database begins to grow, LeadGenius helps you prune prospects, cultivate customers, and zero-in on company decision-makers. Use it to ditch bad leads, unearth new stakeholders and decision-makers, and scale your best-performing campaigns with A/B test-ready email outreach capabilities. Plus, you get unlimited users, so you can scale up without scraping the bottom of your budget barrel. Cost: $$$. Best for: Sales and marketing teams that want to function as one organism. #2. Clearbit. Prospect intelligence on-demand. Okay, so you’ve found a prospect or account that you’d like to target. How do you find and verify its contact info? Identify other key decision-makers within the account? Transform a name and email into dozens of key data points such as role, company size, website, technology stack, and location? Clearbit is your answer. It’s the most efficient way to get quick, actionable sales intelligence, update your prospect list, and assess the viability of new inbound leads you may be capturing. Tremendous bang for your buck, and highly versatile usability for today’s sales and marketing professionals. Cost: $-$$$. Best for: Prospectors, operations leads, and anyone who serves the top of the sales funnel. #3. ZoomInfo. Powerful sales and marketing intelligence. This is the most powerful sales and marketing intelligence tool at this price level. Way more data than Hoover’s. Way easier to use than Data.com. If you’re looking for a cost-effective way to start conducting targeted prospect collection, enrichment, and data cleansing en masse, ZoomInfo is for you. Modern sales and marketing leaders swear by this platform. Cost: $$-$$$. Best for: Sales leaders new to sales intelligence or unhappy with their current provider. 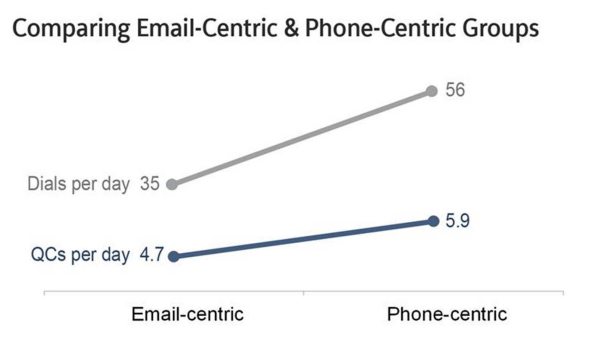 There is an inverse relationship between personalization and scale. Personalization is labor-intensive. It takes effort. A highly-personalized customer experience consumes more resources than one-size-fits-all. Consumers can only absorb so much noise, and personalization is an opportunity to cut through the clutter. The push to personalize everything goes hand in hand with the rise of millennials in the workforce and the need for well-designed customer experiences. From outbound sales and marketing to employee performance management, technology is helping businesses create more personalized, beneficial experiences for prospects, customers, and employees alike. B2B buyers have been conditioned to expect B2C-like personalization. However, in this area, business-to-business companies lag well-behind their business-to-consumer counterparts. B2B companies see the need for personalization—they just have yet to get there. A blanket approach to content and strategy is no longer enough to get the job done. More empowered customers can see it and feel it. 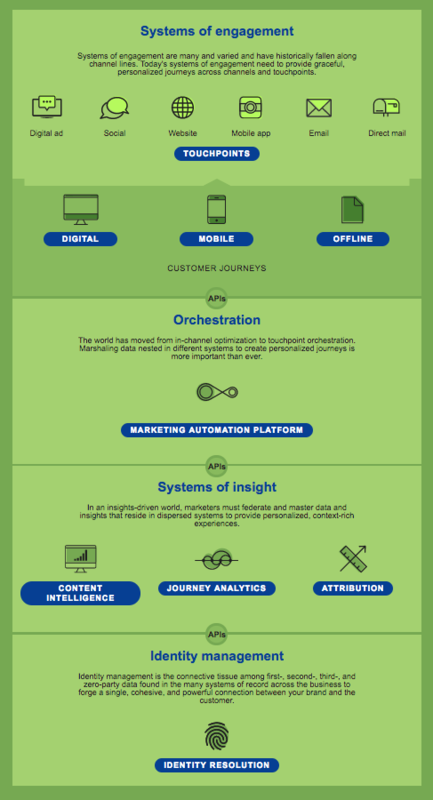 Personalization is necessary to survive and thrive at each stage of the buyer journey. Luckily, technology is making it possible to heavily reduce the resource-investment gap between a highly-personalized customer experience vs. one-size-fits-all. #1. LinkedIn Sales Navigator. The world's comprehensive prospect list. Credit must be given to LinkedIn -- in today’s crowded world of business software solutions, they’ve cornered a critical market like no other. Sales Navigator gives you the keys to the largest prospect database in the world with targeting, list building, and integrations that are nothing short of spectacular. Combine Sales Navigator with a high-powered CRM and sales intelligence tool, and you’ll have a never-ending supply of targeted prospects. Cost: $$. Best for: B2B sales personnel who are never finished prospecting. #2. DiscoverOrg. 360° prospect and account data. The foundation of a successful, scalable B2B sales process lies in your list of target accounts. The more extensive, accurate, and in-depth your list of contacts and their prospect accounts, the better your chances of scaling your sales and marketing efforts. Enter DiscoverOrg. This is the most robust solution in sales and marketing intelligence on the planet. Get full contact lists that auto-update (in your CRM!) as prospect and account information changes. Email, phone, social info, organizational charts and buying trigger data are all included. Cost: $$$-$$$$. Best for: Sales teams selling complex deals to accounts with multiple decision makers. #3. DataFox. Next-generation prospect intelligence. A healthy prospect database is essentially a contact list with the following 3 characteristics: appropriate targets, accurate data, and properly enriched prospect and account information. If one or more of those components is missing from your current database, it’s time to bring in DataFox. This is a great solution that assesses the overall health and quality of your data, identifies and resolves discrepancies, and enables you to quickly discover and add targeted accounts and prospects on the fly. For good measure, DataFox also has a Company Signals feature that adds continuous value and insight to your prospecting efforts. Cost: $$$. Best for: Sales and marketing organizations frustrated by dirty and missing prospect data. It’s people that define the roles that make up B2B sales organizations. From inbound and outbound SDRs, to AEs, inside sales reps, field sales managers, and more, it’s the individuals who grow and learn in these positions that are a business’s direct line to the consumer. They are invaluable resources for information, and are ideally positioned to gain the most intimate understanding of markets and buyer personas. But in reality, it’s rare that B2B sales organizations and the markets they serve are as neatly segmented as they appear to be on paper. This means that collaboration between different segments of the B2B sales org is critical. It is the only way for different roles to adapt, optimize, organize, and coordinate their actions for maximum impact. Video: How ChowNow Segments Its Sales Force via Sales Hacker U. The “qualified sales process” has split B2B sales teams down into lean, purpose-driven units. Because of this, it’s now more important than ever that sales leaders keep track of all of the moving parts while they’re in motion. #1. Outreach. The leader in sales acceleration and collaboration. 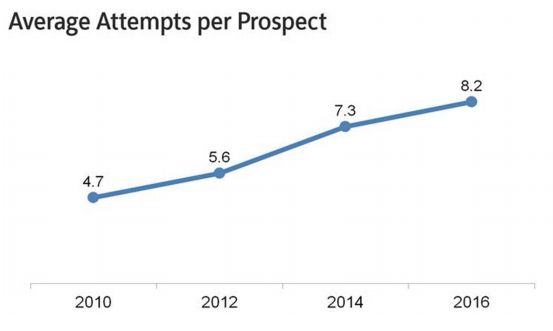 In the battle for the hearts and minds of sales automation and acceleration customers, Outreach has strengthened its status as clear industry leader. Outreach lets managers establish workflow, analyze effectiveness, and keep segmented teams in sync. The value for reps is spectacular, enabling individual team members to absolutely manhandle daily workflow with coordinated, multi-channel prospect communication. Additional data automation, auto-dial and collaboration features (asset/template storage and sharing) shatter every ceiling holding back your team’s efficiency. This is the fastest-growing sales software on the planet for a reason. Cost: $$-$$$. 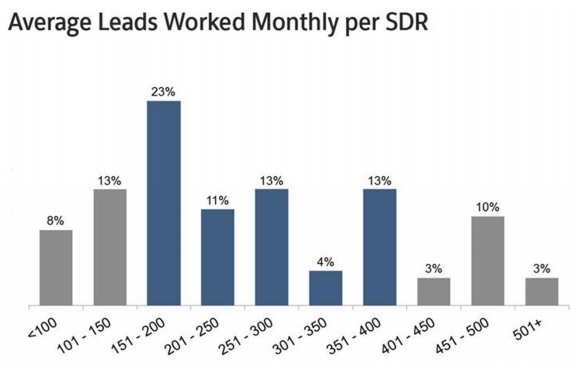 Best for: Any sales team entering the new year with a quota and a CRM. #2. SalesLoft. Sales engagement suite for account-based teams. SalesLoft is an established sales automation platform that comes equipped with auto-dialers, voicemail templating, email tracking, call recording, and tight synchronicity with Salesforce. Tons of functionality for streamlining and improving account-based sales development efforts quickly and at scale. Best for: SMB and mid-market companies looking to scale outbound sales development. #3. Velocify. 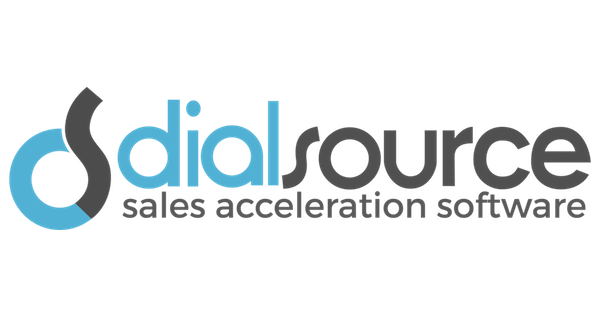 The sales acceleration suite. 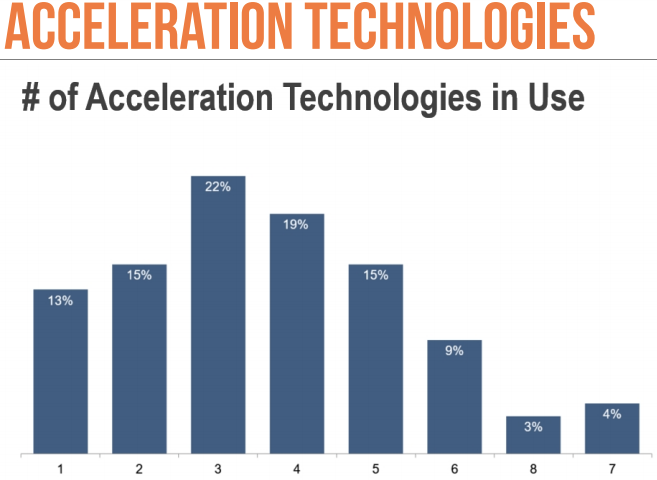 The first thing you should know about Velocify is that you’re dealing with an all-purpose sales acceleration platform. Founded in 2004, Velocify enters its teenage years with three major product suites serving disparate yet essential sales functions. Use Pulse for process enforcement, LeadManager for prospecting automation, and DialIQ for cold calls. No matter what type of sales organization you have, there’s immense value to be gained from this platform. Cost: $$-$$$. Best for: Heavy Salesforce users who hit the phones like it’s still the 1980s. “As much as we talk about it, you can’t manage quota and you can’t manage revenue. The most important data is the data that informs you of what’s actually going on in the sales force and helps you manage reps toward higher performance. 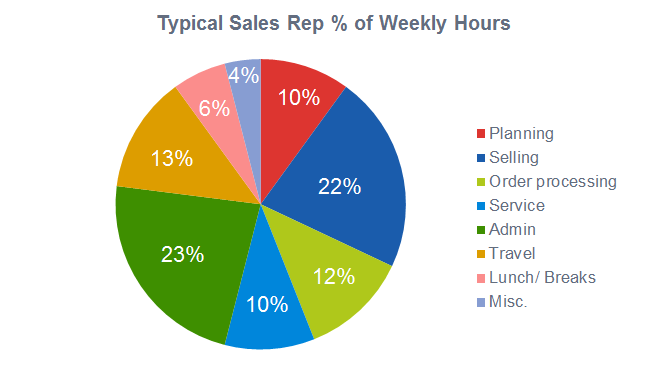 The most useful data is around sales activity." 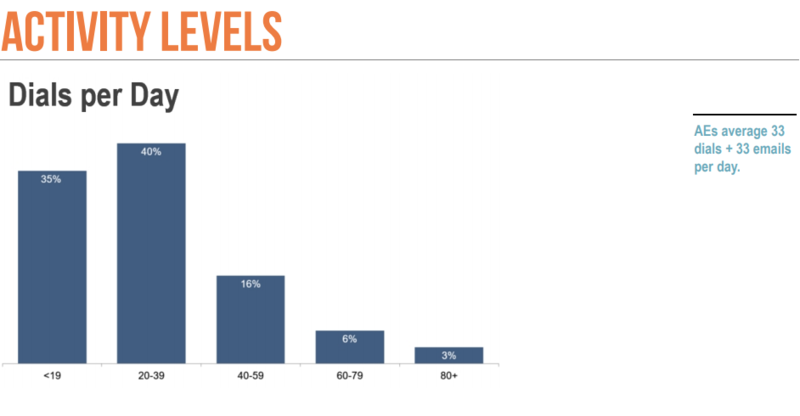 Source: The B2B AE Inside Sales Report via The Bridge Group. It’s important to note that simply making a certain number of dials doesn’t mean that they were productive or successful. As such, you must also focus on the outcomes of these activities. Only then will you be able to continuously iterate your team’s approach and optimize performance. If a large percentage of calls to buyers fitting your ideal customer profile are being marked “not interested,” your reps may need some coaching around how to convey urgency to prospects. Regardless of the outcomes you observe, you come away with a recommended action or follow up analysis that will lead to improvement. And don’t forget to provide reps with a fast and easy way to keep track of both their activity and their outcome goals. Any modern CRM or sales platforms should have one-click, visual reports that allow reps and managers alike to quickly and effectively track performance. 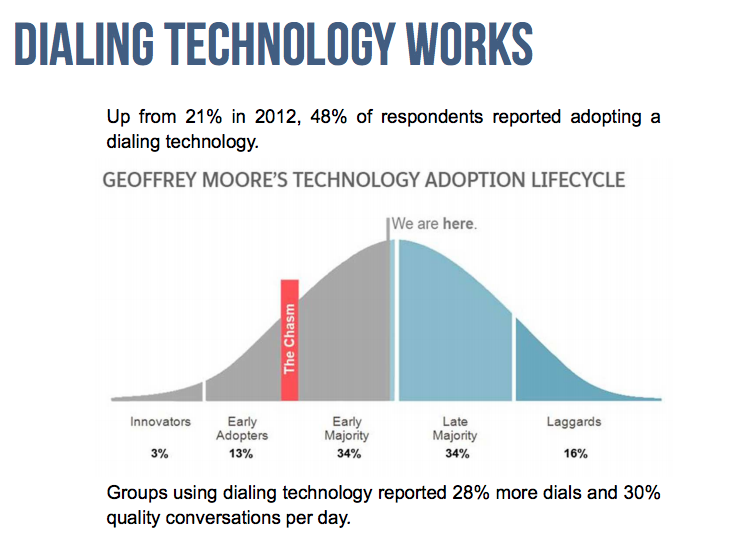 Click-to-call technology automatically syncs call metrics with your CRM, so you can compare activity to outcomes, discern the average number of outbound dials to book a meeting or move a deal to a new pipeline stage, and set goals that will keep your team on pace to complete the number of activities needed to ultimately generate a sale. #1. Tenfold. 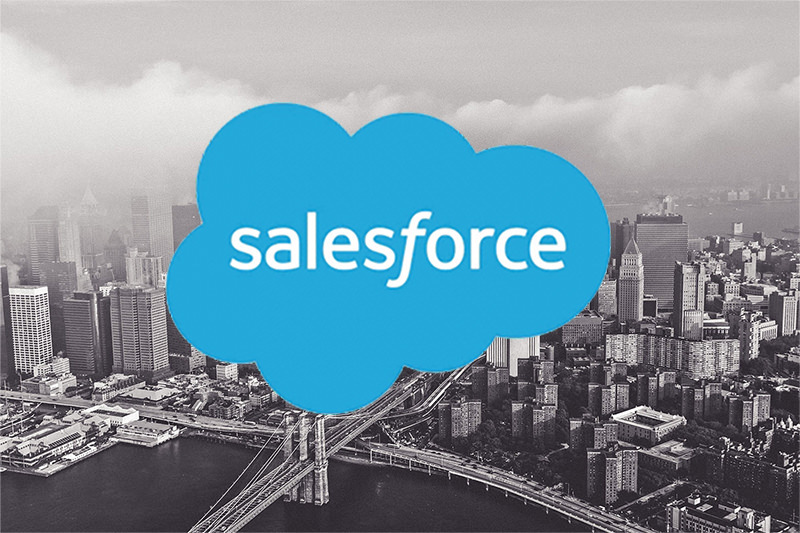 The #1 Click-to-Call Platform for Salesforce. Tenfold is a phone intelligence platform that integrates CRMs and phone systems quickly, enabling companies to enhance prospect and customer interactions. Cost: $$-$$$. Best for: Sales teams looking to sync all their call metrics to Salesforce and other data systes. #2. ConnectAndSell. Better Conversations for Sales and Service. Over 1000 B2B companies use ConnectandSell's cloud sales acceleration platform to increase sales pipeline 5x-8x. Cost: $$-$$$. Best for: Sales teams looking for instant responsiveness to inbound calls and seamless outbound dialing. #3. DialSource. The Full-Suite Salesforce Telephony System. DialSource is the only Salesforce-native telephony solution equipped with multiple dialer modes, post-call automation, robust analytics and inbound/outbound call blending. DialSource empowers agents to make more calls, utilize data, and close more deals. Cost: $$-$$$. Best for: Call centers with a variety of roles constantly manning the phones. Per a study by PwC, millennials “desire a workplace environment that emphasizes teamwork and a sense of community” and “value transparency” at higher rates than their older colleagues. As Millennials have graduated and moved into the professional world, they’ve brought their modern expectations and favorite tools with them. An environment that for decades has largely been ruled by Microsoft is suddenly fractured, full of new-world alternatives that reward openness and collaboration over hierarchy and siloed information. 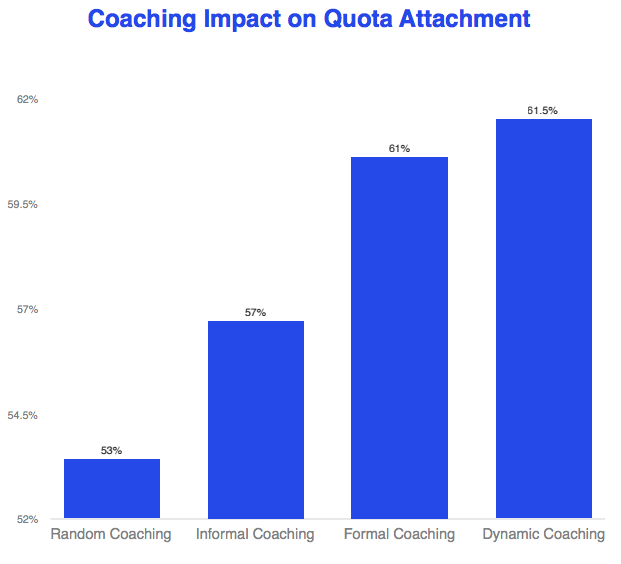 In related news, CSO Insights finds that sales organizations using a formal collaboration approach saw a 21% improvement on quota attainment compared to organizations using an ad hoc approach. Where all of this fits together: sales organizations that enable their teams to proactively collaborate internally and communicate transparently with prospects and each other are more effective overall. 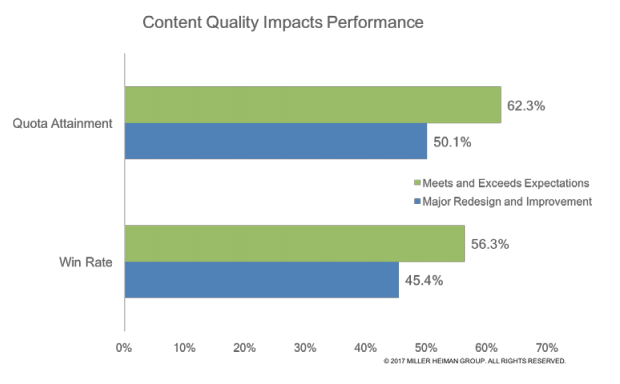 Developing higher-quality content that's simple to source and even easier to tailor to your buyers is a key beachhead that underscores the value of enabling collaborative sales communication practices. #1. Docurated. The leading content management system. Cost: $$-$$$. Best for: Companies with lots of great content, but no streamlined processes in place to help sales reps leverage it. #2. Prezi. Start the dialogue -- close the deal. Just about everyone gets tasked with presenting information at some point, whether to a small team or to a board of busy executives. In any case, nobody wins if that presentation is boring, typical, and easy to ignore (or forget). That’s why Prezi created conversational presenting, a highly visual, flexible, story-based approach to sharing information that engages rather than overwhelms. By opening up a dialogue with your audience and using strategic visual storytelling, Prezi allows you to develop presentations that are infinitely more persuasive, memorable, and successful. Cost: $. Best for: Reps who want to have meaningful, memorable conversations that show how different ideas intersect..
#3. DocSend. Find and share documents that close deals. DocSend is emerging as a best-in-class addition to the sales content management space. Your sales reps should never have to hunt for go-to case studies, 1-pagers, and other valuable sales collateral. DocSend is built for speed and shareability. Effortlessly organize and track content. Use straightfoward analytics to track the journeys of each presentation and PDF through your account. This is the perfect combination of functionality and user-friendly interface your sales org needs. Cost: $-$$. Best for: Sales organizations looking to launch smart, simple, data-driven content management. One of the most logical extensions of Trend #5 goes specifically to the closing process. The contract negotiation and final signature stage of a buyer's journey is the climax of every deal. 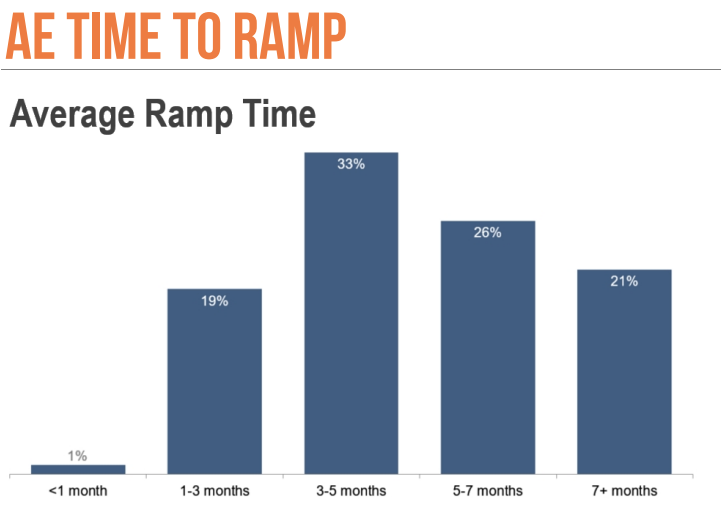 For more complex B2B sales, it can take years of work to reach this point. If there is one place in your sales process where the organization needs to enable and streamline both the seller and the buyer, it's the close. Flexible templates, collaborative objection-handling frameworks, and battle cards versus competitors are just a few examples highlighting the importance of sales enablement in this final stage of the sales process. Modern esignature technology and content management tools are becoming increasingly adept at addressing the broad array of needs within the scope of one single platform. #1. HelloSign. Modern eSign for collaborative sales teams. This agile and affordable eSignature solution is quickly dominating the market, thanks to its ability to fully integrate with Google Apps, Box, Dropbox, Slack, and Evernote. If your sales team gets notifications about new contracts out for signature pouring in on the daily, HelloSign makes it worth it. Status notifications, templates, and branding are just some of the cool features that give you everything you need to add transparency, excitement, and collaboration at the bottom level of your sales funnel. Cost: $-$$. Best for: High-growth sales organizations with contracts flying around and a preferred team chat or collaboration tool. #2. DocuSign. The original eSign platform. Getting a contract on the table is hard enough as it is. DocuSign lets you manage, send, sign, and redline legally-binding documents electronically with next-to-zero hassle. Time is the killer of all deals, and a contract dispute is only a good time for the company lawyers on the other side of the table. DocuSign is the fastest, most secure way to put the finishing touches on a hard-won sell. Your closers deserve it. Cost: $-$$. Best for: Rational sales organizations who think like Don Draper: not Harvey Specter. #3. GetAccept. eSign automation, analytics and tracking. 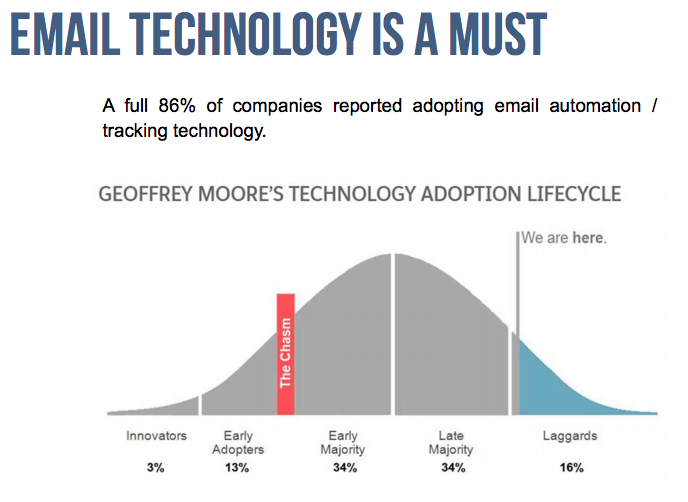 GetAccept is a sales document automation platform specifically designed for the lower half of your sales funnel. It’s the only platform that offers a robust combination of 1-to-1 prospect communication, video, reporting, and eSignature. Additional features sweeten the pot, such as remarketing tools (for lost opportunities and dead accounts), live notifications on prospect interaction (for hot accounts), and analytics detailing the performance of your sales assets. GetAccept is also super affordable, perfect for cost-conscious SMBs and mid-markets. Best for: Growing B2B sales teams focused on improving conversion rates. The noise behind Account Based practices has been deafening at times, but the buzz has been building for good reason: when used correctly, account based tactics can shorten the buying cycle, increase lead-toopportunity conversion rates, decrease Customer Acquisition Cost (CAC), and reduce churn. Again, the list goes on. A well-run account based strategy can have a positive impact on most marketing and sales Key Performance Indicators (KPIs). At its core, an account-based strategy is a holistic business-tobusiness strategy that enables companies to more effectively sell into a targeted list of accounts. Highly-personalized messaging, through a variety of channels, is used to target to multiple decision makers to help speed the buying process along. The idea is to no longer have a massive, wide open marketing funnel, but rather to channel efforts efficiently and strategically. So how is Account-Based Marketing different than “Enterprise Sales?” The difference is scale. An account-based strategy can be used to target a company of any size. Instead of messaging only to decision makers within a company, all revenue generating teams (Marketing, Sales, Customer Success, Product, etc.) work together to simultaneously target multiple decision makers, with different roles and responsibilities. The concept involves leveraging dynamics of group psychology to close an account. New technology is making the tried-and-true personal approach approach of enterprise sales scalable and cost-effective for targeting SMBs. #1. Engagio. Run account-based everything, anywhere. Engagio is leading the account-based movement with a complementary platform that syncs directly to existing marketing automation solutions. Engagio adds value by equipping marketing, sales, and customer success with account-centric analytics and orchestrated outbound interactions. Account insights range from who to target, who’s engaged, and which accounts are getting touched by marketing and sales. If those numbers are important, yet foreign, to your current strategy, give Engagio a look. Cost: $$-$$$. Best for: Companies that are running account-based anything. #2. Terminus. Scalable, simple account-based marketing. Terminus brings an amazing level of simplicity and scalability to marketing teams that in the beginning stages of scaling their strategies. Using the platform’s sleek, no-nonsense interface, B2B marketing leaders can set up and run tailored campaigns in 3 easy steps. If you’re new to ABM and need a platform that can show you the ropes while you see your strategy through to completion, Terminus is a great option. Cost: $$-$$$. Best for: Entry-level account-based marketing teams using Salesforce. #3. LeanData. 360° ABM for rapid insight and response. The more disciplined, strategic, and coordinated your sales lead management, the higher the returns from all your sales and marketing efforts. Unlike the prototypical CRM or Marketing Automation platform, LeanData focuses exclusively on all things lead management. Get total transparency on attribution, routing, workflow, and sales cycle progression with drag-and-drop self-serve interfaces and visually compelling real-time reporting. Cost: $$. Best for: Sales organizations that lack coordination and insight into sales lead management. Sprints, scrum and iterative development make sense for software, project management and even marketing teams, but they’re not even close to being aligned with how an elite sales team works, right? Not exactly. 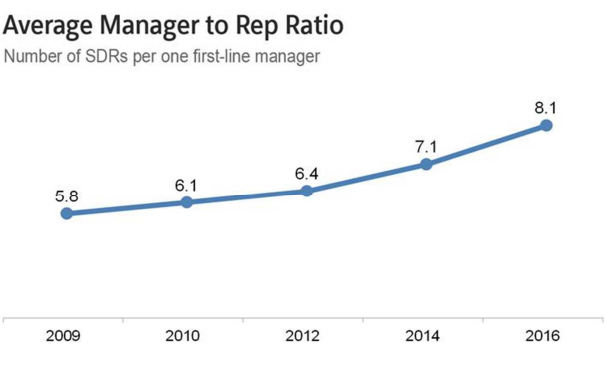 Source: The State of the Manager via Gallup. Let’s apply a few agile methodologies to industry research and best practice espoused by 3 elite sales management experts. Sprints and Milestones: In Harvard Business Review, Jason Jordan shares critical research on the importance of zeroing sales management focus on activity versus objectives and goals. Scrum and Stand-Up: Sandler Sales Management trainer Marcus Cauchi advises starting each day with a quick sales team huddle, where everyone shares their top 3-4 behavioral goals. Iteration: Aaron Ross subscribes to using a systematic, feedback-driven process for successful outbound prospecting – or iterative development. 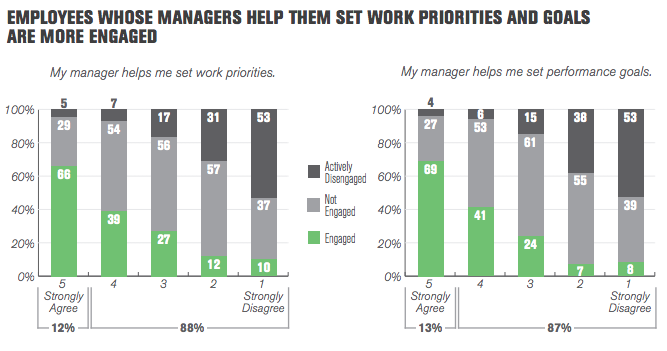 Factor in the arrival of feedback-hungry millennials, longer new hire onboarding and ramp times, and a growing rep:manager ratio, and you can see the benefit to sales management automation. Per Mike Weinberg in The Ultimate Guide to Agile Sales Management, “The move to agile means that accountability and transparency are back in and talking trendy nonsense etherial sales concepts is out! Today’s managers must be laserfocused on results and regularly meeting 1:1 with their people to review results against goal, overall pipeline health, and what I call ‘additions’ and ‘advances’ within the pipe. This regular meeting quickly reveals who needs helps and which reps need to be either coached up or coached out, and it provides management insights necessary to be agile in decision making." The numbers speak to the importance and immediate benefits of agile sales management practices. The sales technology marketplace is rising to meet these needs in a variety of forms - ranging from 360° sales management systems, to video-based learning management systems, to sales development management tools. #1. Ambition. Drive Your Entire Sales Force. Ambition gives 360° visibility into individual and team performance. Create accountability and recognition with live performance data from any data source. Track and broadcast key metrics to personalized dashboards and office TVs. Put holistic goals right in front of your reps. Compare activity level and goal attainment across teams to see how hard and how smart your reps are working. Benchmark success for teams, roles and individuals, then drive results via automated scorecards, contests, recognition and reporting. Perfect for front office teams that value performance-driven culture and transparent operations. Cost: $$-$$$. Best for: Data-driven sales teams that want instant performance visibility, insights and recognition. #2. LearnCore. Smart, Systematic LMS for sales. LearnCore takes sales, account management and customer support team onboarding, training, and coaching to dizzying new heights, thanks to its versatile array of features and friendly digital interface. Track new hire onboarding and learning, coach and train using in-game footage, and create a dedicated, organized system for getting the most out of your front office personnel. Cost: $-$$. 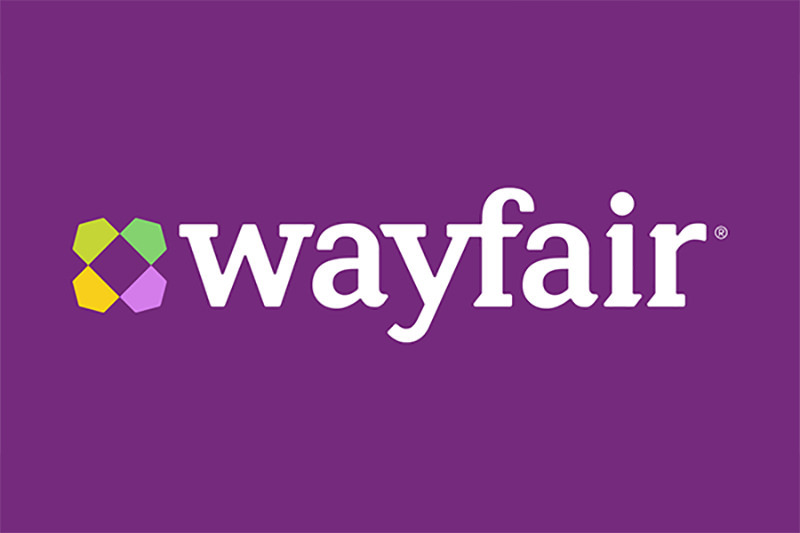 Best for: High growth, mid-market and enterprise companies that use Salesforce. #3. Costello. Sales Knowledge Management. Costello is the deal management platform that aligns sales reps, managers and VPs to work together to win more deals. Consistently follow sales methodology, give reps and managers instant visibility into the quality of every deal and help sales leaders understand what's working and what isn't. Cost: $-$$. Best for: Highly active sales development teams selling B2B deals. 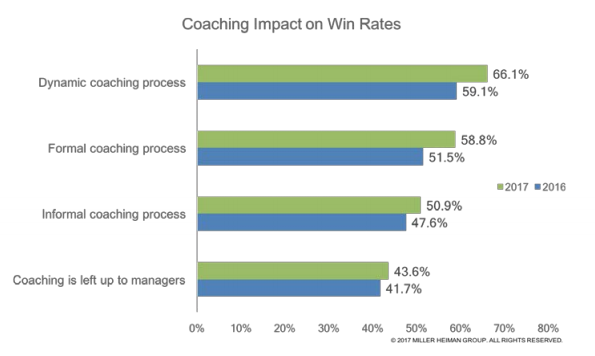 In 2016, the Sales Executive Council found that coaching was the #1 worst sales management skill. 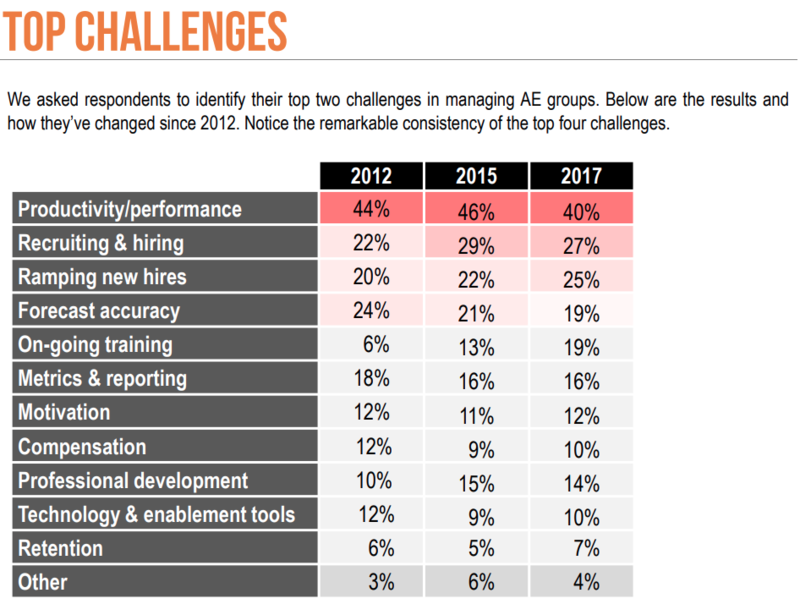 In 2017, the Bridge Group reported that improving sales team productivity and performance was the #1 challenge for sales managers - for the 5th year in a row. Thankfully for 2018 sales leaders, modern sales technology now offers the closest thing to "game film" for rep calls, meetings, and demos. Managers can't be everywhere at once, but thanks to this emerging technology, they have call replays, analytics and storage at their fingertips to review in their spare time. #1. Gong.io. Instant replay and analysis for sales calls. Sales organizations that use any major web conferencing service to engage with prospects will get instant value from Gong.io. Think of it as an instant replay system with in-game analysis that’s powered by AI. Gong.io also provides teams with a call recording library, auto-routing to managers and peers, and a time-specific comments section for each recording. A smart way to drive better onboarding and coaching in one fell swoop. Cost: $$. Best for: Sales organizations that primarily conduct calls and meetings via web conferencing. #2. ExecVision. Coach better sales conversations. Bringing ExecVision into your sales organization is the business equivalent of locker room film study. You’ll wonder how you ever lived without it. ExecVision delivers the full suite of features needed for optimum call coaching, including live call feeds, feedback channels, recording, analytics, scorecards, storage, organization, and reporting. It’s also the product in this guide most likely to be approved by both Pete Carroll and Jordan Belfort. Best for: Mid-sized inside sales teams that hit the phones throughout the entire sales process. #3. Chorus.ai. AI-powered meeting recording and analytics. Enabling your entire sales team to make their number seems to be an insurmountable challenge. Chorus.ai can help transform every account executive into a top performer by recording and analyzing your customer meetings in real-time. Leverage it to build training programs using highlight reels detailing how your top performers handle specific topics, manage the flow of the meeting, and more. Automatically record, transcribe and analyze meetings in real-time. Gain critical insight into your sales opportunities and meeting performance. Cost: $$. Best for: Growing sales teams that work with dialers, web conferencing and screenshare tools. As noted in The Ultimate Guide to Agile Sales Management, an astounding 44% of sales executives believe that their organization is ineffective at managing its sales pipeline. Fortunately, many SaaS companies have been incorporating machine learning technology into their platform. In 2017, these companies will have gathered enough data to make machine learning a true valueadd to their platforms. Predictive is on the rise because lead prioritization, personalization, and content output are all time-consuming to do at scale. Having clean, complete data is the first step. Forming a cohesive plan of attack for each is the second. Third is implementation, execution and adaptation based on what the data instructs. Done right, machine learning has the opportunity to advance B2B sales like never before by doing all of the time-consuming, inefficient dirty work that data-driven outbound teams must do in order to drive more successful conversations. #1. Clari. The Sales Execution and Forecasting Platform. Clari helps sales teams drive more revenue and increase forecast accuracy through improved deal execution and predictive analysis of active opportunities. Cost: $$-$$$. Best for: SMB, high growth, and mid-market and sales organizations with reliable data. #2. InsightSquared. Sales analytics that’s built for humans. InsightSquared provides sales forecasting, process insights, and granular pipeline trends, all in one platform that’s infinitely more engaging than the typical CRM report. Perfect for SMB, Growth and Mid-Market companies (SaaS companies are its specialty), InsightSquared offers just the right level of functionality for science-minded sales managers, ops, and reps. Cost: $$-$$$. 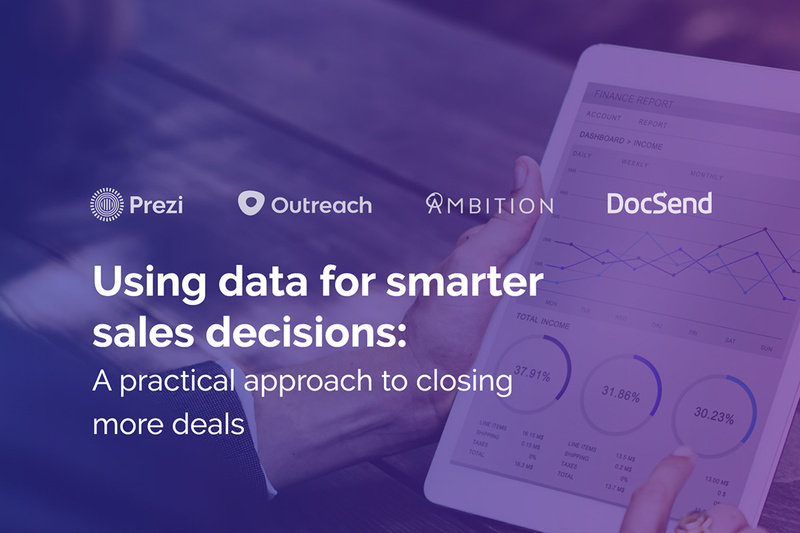 Best for: Data-driven SaaS sales organizations. #3. Infer. Predictive lead-scoring and intelligence. Scoring leads based on their ideal customer profile fit and engagement with your sales and marketing is a lynchpin of modern sales-marketing alignment. Infer offers amazingly granular insight into prospect characteristics and interactions at all levels of your sales and marketing funnel. Its customizable analytics give you a surefire way to assess the evolution of ICPs and the warmth of target accounts. Cost: $$-$$$. Best for: High growth, mid-market, and enterprise sales organizations with defined ICP(s) and maturing sales and marketing processes. In its authorative article on the digital transformation of sales, Accenture denotes the importance of using sales enablement and AI to improve customer experience throughout the entire B2B funnel. "B2B customer promoters deliver 3X the profit than detractors. 80% say customer experience is a strategic priority yet less than 25% excel at it." Forrester also recently published its high-profile predictions on where sales enablement is heading in 2018. Source: Forrester Top Technology Trends, 2018-2020. According to Forrester's research, the demand for automation has never been higher, as "customers expect fast, personalized experiences through frequently-updated apps." So agrees Accenture's analysis. Their aforementioned article points out the specific function AI is set to serve for sales teams in 2018 - automating time-consuming administrative tasks. "With machines like chatbots and digital assistants handling high-volume, low-value transactions, rapidly and at low cost, sales teams will be empowered to focus on high-value strategic sales. Through this approach, significant reductions in cost per sale can be achieved, with the time spent on sales administration cut by up to 60%. Cost savings achieved through digital in back-end marketing and sales operations can be reinvested in in-year growth initiatives." 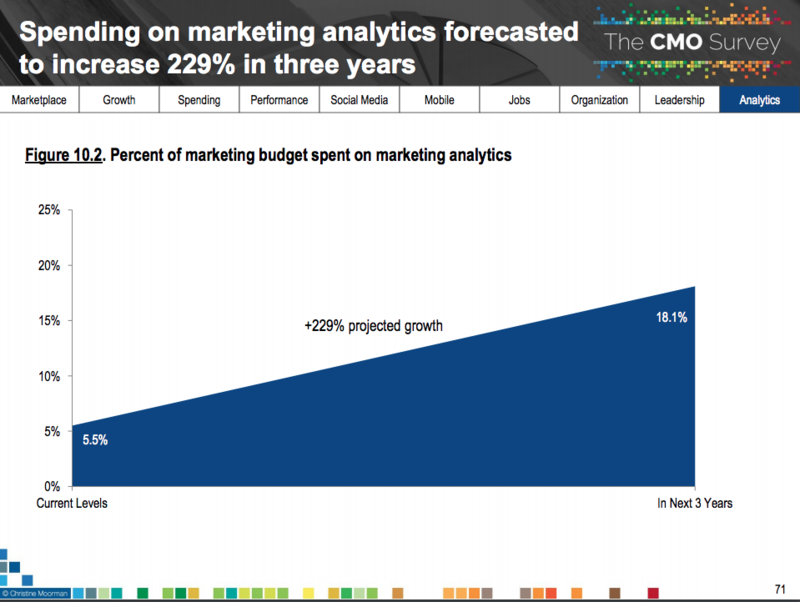 In terms of overall sales and marketing technology spend, Deloitte forecasts the following 3 year growth numbers based on their 2017 CMO Survey Report. Source: The 2017 CMO Survey via Deloitte. 60% of Execs believe they're behind in digital transformation. 20% of CEOs will fail to act on digital transformation. 30% of companies will see further declines in CX performance. Don't become a statistic. Get aggressive and go on the offensive with your sales enablement strategy in 2018.